Established in 1981, Criterion Executive Search of Tampa, FL, was a strong local leader in the Executive Staffing game and recognized locally as the premiere Insurance staffing firm. As Florida's population exploded, so did it's need for staffing services, placing Criterion Executive Search as the foremost staffing agency in the Tampa Bay area. In 2001, Criterion Executive Search came to High Octane Brands to bring establish their brand in the national recruiting marketplace. We took Criterion Executive Search on a literal journey, or "brand renaissance" as we like to think of it, helping them evolve into a relevant executive search and placement brand based on the spirit - not just the experience - of staffing that spoke to people at all levels of of their career pursuits and achievements. High Octane Brands served the company in multiple capacities, from the Board level to developing the brand strategy to building common materials to serving as creative agency of record. Criterion Executive Search enjoyed a 24% increase in search volume parallel to the brand re-launch. The obvious benefit in this new traffic bolstered net gains for the company and employees alike. In continuing brand expansion High Octane Brands delves deep into their markets with ongoing research so that we can continually guide their brand and stay ahead of employment trends. 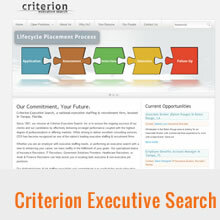 In 2008 Criterion Executive Search expanded it's services into I.T. and Healthcare.